We are indulged in providing an excellent quality of Waterproof Grout to our customers. 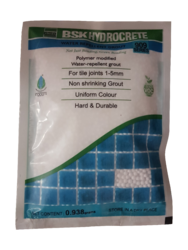 The grouts can be named as Joint Filler, Non shrink Grout, Cement Joint Filler, Polymer Grout, wide joint Grout Etc. Aqua Seal Polymer Grout, waterproof grout is a single part high degree of hardness, calibrated and smooth finish that is suitable for high resistance grouting from 1 mm to 12 mm on all horizontal and vertical surfaces with a complete range of tiles and stone. It is thixotropic. It's Polymer Based Powder Water Repellent Grout.